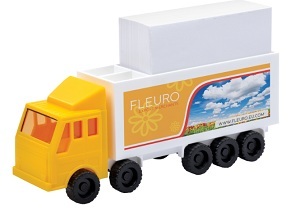 Lorry Memo Holder - Express Corporate - Promotional Products - Delivered Fast! Lorry shaped paper block holder. Contains approx 300 loose sheets of plain white 80gsm paper. Available in a single colour or mix and match colours for the cabin and trailer. Holder printed to two sides.